Petra Nova, a U.S.-Japan joint venture to capture carbon dioxide from coal combustion and use it for enhanced oil recovery, became operational on January 10. It is the world’s largest post-combustion plant, capturing over 90 percent of the carbon dioxide generated from a 240 megawatt facility, ultimately about 1.6 million tons a year. Petra Nova is significant not only for its scale but also as one of only two commercial scale post-combustion systems on a power plant; the second being Canada’s smaller Boundary Dam project. The 50/50 venture between NRG Energy and JX Nippon Oil & Gas Exploration Company is located near Houston, Texas at NRG’s Parish WA power station. It received $190 million of its total cost of $1 billion from the U.S. Department of Energy. The Japan Bank for International Cooperation (JBIC) and Mizuho Bank Ltd. also provided loans totaling $250 million. It uses the advanced amine-solvent for CO2 absorption and desorption capture process (KM-CDR Process®) jointly developed by Mitsubishi Heavy Industries, Ltd. (MHI) and Kansai Electric Power Co. The 99.9 percent pure CO2 is piped to Hilcorp Energy Company’s West Ranch Oil Field for enhanced oil recovery (EOR), enabling a rise in oil production from 300 to 15,000 barrels per day. The International Energy Agency states in its 2016 Medium-Term Coal Report that “whereas coal will continue to be the preferred source of power generation, the share will decline from over 41 percent in 2013 to around 36 percent in 2021.” Coal currently generates about 30 percent of energy-related CO2 emissions globally. Most retirements of coal plants will occur in Europe and North America while Japan’s and South and Southeast Asian nations’ use of coal continues. Importantly, however, the amount of coal demanded doesn’t decline and could increase as the global demand for energy increases. Thus, the commercial viability of capturing, using and storing carbon dioxide from existing and new power plants is essential to meet environmental and climate goals, particularly in Asia. Together with SaskPower’s Boundary Dam project, Petra Nova represents a major milestone by demonstrating the viability of post-combustion carbon capture, use, and storage technology at coal-fired power plants. Another route to cut CO2 and other emissions is for all new coal-fired power generation plants to be high efficiency, low emissions (HELE). The best HELE plants are 42-50 percent energy efficient, compared to 27-33 percent for a subcritical plant. HELE plants require 20 percent plus in additional upfront expenditures but save long-term due to lower fuel costs associated with higher efficiency. The best existing HELE plants, such as J-Power’s Isogo facility in Yokohama, cut CO2 emissions by only around 17 percent, compared to a subcritical plant with the prospect of 30 percent with new technology. Therefore, to achieve deep CO2 emissions reductions, new HELE plants will still need CCS. CCS will raise initial costs, which could be at least partially offset as Petra Nova is doing by using the CO2 in applications such as enhanced oil recovery (EOR). 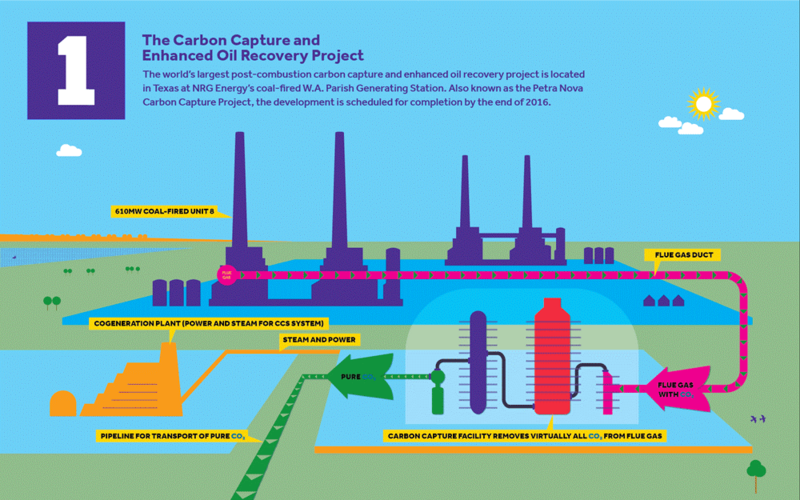 According to the Global Carbon Capture and Storage Institute (GCCSI) 2016 status report, over 20 large-scale CCS projects will be operational by the end of 2017, along with a number of smaller scale demonstration projects. GCCSI is tracking an additional 18 large-scale projects in execution, well-defined or planned. Together with SaskPower’s Boundary Dam project, a smaller Canadian facility opened in 2014, Petra Nova represents a major milestone among these facilities by demonstrating the viability of post-combustion carbon capture, use, and storage (CCUS) technology at coal-fired power plants. There are 2.308 gigawatts of capacity in existence or under construction, and an additional 596 gigawatts planned. The IEA estimates that post-combustion CCS could be installed on around 29 percent of existing global capacity; that which is not too old, small and inefficient. Part of that 29 percent also would likely lack nearby storage options. Three additional large-scale post-combustion large-scale CCS projects are planned in the next few years, one each in the Netherlands (2019-2020), China (2020s), and South Korea (2020s). Japan’s signature Tomakomai Demonstration Project with ¥340 million ($300 million) from the Ministry of Economy, Trade, and Industry, is focused on CCS capture and storage for industrial separation in industries such as iron and steel, fertilizer, hydrogen, cement, refineries, and biomass conversion. Globally, there are 11 large-scale CCS industrial separation projects, operational or planned. The project’s implementer, Japan CCS Co., Ltd., has 35 corporate shareholders, including most of Japan’s electric utilities and natural gas companies. It captures carbon dioxide at a hydrogen production unit at Idemitsu Kosan’s Hokkaido Refinery and injects it into two offshore geologic formations. It is proven that CO2 can generate revenue from enhanced oil recovery, but additional uses need to be developed and the suite of technologies for capture, storage, and transport still needs substantial improvement to be truly commercially viable. The U.S. and Japanese governments are cooperating on this important technology. The U.S. Department of Energy and Japan’s Ministry of Economy, Trade, and Industry signed an Implementing Arrangement in 2015 to conduct joint or cooperative research projects and programs; exchange technical information and results and methods of R&D; exchange technical and managerial personnel and equipment, materials, and instruments; and conduct joint conferences, seminars, and workshops. One of the first products of the collaboration is a white paper on funding and other resources for large-scale CCS. CCS is maturing but is still far from fully grown. 2017 marks the 21st year of Statoil’s Sleipner Project’s operation in Norway, the first industrial-scale CCS project. Petra Nova demonstrates that CCS has improved significantly since Sleipner began capturing CO2 and inserting it into dedicated geological storage. It has moved from small-scale to large-scale commercial demonstrations. Long-term CO2 geological storage has been demonstrated successfully and monitored. Supportive policies and regulatory schemes continue to be developed and tested. It is proven that CO2 can generate revenue from EOR but additional uses need to be developed. However, the suite of technologies for capture, storage, and transport still needs substantial improvement to be truly commercially viable not only in Japan and the United States, but also in emerging economies like India and Indonesia. Companies and research institutes continue to develop new and innovative technologies. Major players include companies such as Fluor, Alstrom/GE MHI and Hitachi and research institutes such as Japan’s Research Institute of Innovative Technology (RITE), the U.S. National Energy Technology Laboratory (NETL) and Norway’s Technology Centre Mongstad (TCM). There are new types of compressors, non-pipeline transport technologies, new solvents, amine-based capture, supercritical CO2 cycles, new materials, and others. As with nuclear energy, there is movement towards standardized modular systems for use in power plants and industrial facilities that have the potential to be easier and less expensive to deploy. Power grids and industrial facilities are decarbonizing. It is still unclear how far this process will proceed given global energy mixes and economics. Because fossil fuels will continue to be relied upon for the foreseeable future, CCS along with renewable and nuclear energy is essential if the power sector and industrial facilities are to decarbonize. Petra Nova exemplifies the type of international collaboration necessary to make CCS commercially viable. CCS is an area in which deeper U.S.-Japan collaboration makes sense and will be key to making CCS a viable part of the sustainable energy toolkit.